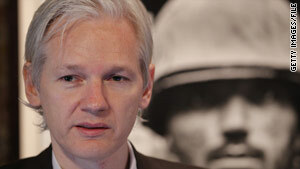 Criticism of WikiLeaks has put into question whether its founder, Julian Assange, will release more documents. Washington (CNN) -- The online leak of thousands of secret military documents from the war in Afghanistan by the website WikiLeaks did not disclose any sensitive intelligence sources or methods, the Department of Defense concluded. Secretary of Defense Robert Gates said there is still concern Afghans named in the published documents could be retaliated against by the Taliban, though a NATO official said there has been no indication that this has happened. The assessment, revealed in a letter from Gates to the Chairman of the Senate Armed Services Committee, Sen. Carl Levin (D-Michigan), comes after a thorough Pentagon review of the more than 70,000 documents posted to the controversial whistle-blower site in July. The letter, provided to CNN, was written August 16 by Gates in response to a query by the senator regarding the leak of classified information. Gates said the review found most of the information relates to "tactical military operations." "The initial assessment in no way discounts the risk to national security," Gates wrote. "However, the review to date has not revealed any sensitive intelligence sources and methods compromised by the disclosure." The defense secretary said that the published documents do contain names of some cooperating Afghans, who could face reprisal by Taliban. But a senior NATO official in Kabul told CNN that there has not been a single case of Afghans needing protection or to be moved because of the leak. "We assess this risk as likely to cause significant harm or damage to national security interests of the United States and are examining mitigation options," Gates wrote in the letter. "We are working closely with our allies to determine what risks our mission partners may face as a result of the disclosure." Gates also said there is still the possibility of more documents being published, for which the Pentagon is preparing. Over the summer, the Pentagon created a team of more than 100 personnel made up of mostly intelligence analysts from various branches of the Defense Department as well as the FBI, who were involved in the round-the-clock review. WikiLeaks has approximately 15,000 more Afghanistan documents that the site is reviewing because they contain names or other sensitive information. While initially the sitefounder, Julian Assange, had vowed to publish the additional documents after redaction, there is now some question whether that will happen given the intense criticism WikiLeaks came under after Afghan names were found in the already published files. Additionally, WikiLeaks is expected to publish as early as next week about 400,000 military documents from the Iraq war that were leaked to the site. The leaking of the documents raised the immediate ire of military officials although soon after the posting they questioned the documents' significance. Back in July, Chairman of the Joint Chiefs of Staff Adm. Mike Mullen, said he was "appalled" by the leak but said the documents were from previous years up to 2009 and "much has changed since then." Despite this, the military warned that the naming of Afghans was a huge concern. Wikileaks has "the blood of some young soldier or that of an Afghan family" on their hands, Mullen said. In addition to the document review, the military has launched a criminal investigation into the leak. Since the initial publication of the documents, military officials consider Army Pfc. Bradley Manning a prime suspect in the leak. Manning is already being held in Quantico, Virginia, charged with leaking video of an Iraq airstrike to WikiLeaks as well as removing classified information from military computers. CNN's Pentagon Correspondent Barbara Starr contributed to this report.